Beard oil is a moisturizing substance laden with a lot of other benefits that is supposed to be applied gently on the beard hair. As beard is so much in style, and it does require attention once you have grown one. Beard oil, and that too a great one is the ultimate solution to all problems associated with keeping a germ-free, soft as well as masculine beard. How to use Royal beard Oil? Using beard oil is easy, and its use is often advised post-shower or post-bath. Take a dab of Royal beard oil on your finger; spread it on your fingers and slightly on the palms as well. Apply it on the beard by gently massaging it on the beard. Work the remaining oil on your fingers through the ends of the moustache, if you have kept one. Beard oil is the greatest addition to your bathroom regimen if you are one of the trendy beard-men because of many reasons. Many men tend to avoid maintaining their beard because they find it girlish to spend that much energy on their face. Well, beard oil is a sophisticated yet masculine way to maintain a dandy beard without spending much time on it. Nourishing facial hair is just as important as scalp hair. Hair that is nourished by vitamins, nutrients and minerals are smooth and healthy. Royal beard Oil not only brings health to beard hair but also makes them look neater by making them smooth and tangle-free. A near beard gets a lot of attention, trust me. Yes, the royal beard oil comes in with a great scent and is ought to attract other because of its amazing yet masculine fragrance. Moisturizing function of the Royal Beard oil saves the beard from the wrath of beard flakes and also enhances beard hair's natural oils for hydration. The key recipe to making beard oil is extremely easy as it is merely proper blending of a few useful oils together. The only difficult part of making beard oil is getting hold of the diverse range of oils to be put together. Beard oil can bring magical results to your beard if it has been made by oils that are pure and contamination-free. 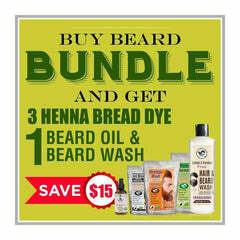 What is The Henna Guys Royal Beard Oil? The royal beard oil is a product of the brand name The Henna Guys belonging to “The henna guys". The constituents of this specific oil include mainly Jojoba Oil, Argan Oil, Evening primrose oil and Organic extra virgin Coconut Oil serves the purpose of carrier oil. The recipe ingredients of the Royal bears Oil would be incomplete with certain amounts of Sunflower seed oil and Vitamin E oil which is ever popular for its antioxidant property. This is different and so much better than other beard oils easily available in the markets around the globe, as the oils are organic and nothing else. They are nontoxic and lock the moisture of the beard hair as well as the skin itself. Evening primrose oil is the element that is responsible for introducing shine to your beard because it is rich is essential fatty acids. In addition to that, another component present in The Henna Guys Royal beard oil that is rarely found elsewhere is sunflower seed oil. Sunflower seed oil helps your beard hair to grow at a better rate. This is the healthiest way to bring volume, smoothness and length to your beard. It helped to eliminate beard dandruff, itching, and overcome the dryness. My beard is grooming day by day with the use of royal beard oil. I had already tried beard oils from other companies but no satisfactory results were noted.